After a wild night Grand Prix of Singapore two weeks ago, world championship points leader Mark Webber and the Red Bull Racing team leads the 2010 Formula 1 pilots into Suzuka, Japan. Becoming a definite crunch time for the 2010 Formula 1 season, the driver and manufacturer's point races heading into Japan are so close into the final races that the standings can still be dramatically reshaped after a single event. Webber leads by an 11-point margin over recently red-hot Ferrari driver Fernando Alonso. Known as a very technical and challenging track, the 3.609 mile Suzuka Circuit, the Honda-owned race complex has history for being a deciding event in the Formula 1 driver's championship. Still in contention 21 points behind his Red Bull Racing teammate Mark Webber, Sebastian Vettel showed in both Friday practices he was willing to meet the challenge in becoming a firm fighter for the 2010 title. The fastest in both sessions, the Red Bull-Renault's 1 minute, 32.585 second time in the first practice was bettered with an 1 minute, 31.465 second lap in the second afternoon session. Backing up Vettel, Mark Webber timed laps competitive with his teammate as the 2nd fastest in the two practices. Showing the more elder teams of Ferrari and McLaren, Red Bull Racing is ready to end the year strong for what will be monumental acclaim. Showing a consistent top-three in both sessions Friday, the Renault F1 Team's lead driver Robert Kubica was the 3rd fastest. With Kubica's expertise serving him well at the Suzuka circuit, his rookie teammate Vitaly Petrov approached the track as anew lesson. Having not raced on the Japanese race track prior to this grand prix weekend for Formula 1, Petrov rallied in the second practice session to a 7th overall time. Petrov's Renault was running softer Bridgestone optional tires for the run but nonetheless performed well on his first showing at Suzuka. Also transitioning their way back from a unremarkable first practice effort, the Ferrari squad were without their blazing speed of recent grand prix weekends. With Brazilian Felipe Massa leading the team with an 11th quickest time in the early practice, the later practice saw Fernando Alonso leading a 4th and 5th fastest result. 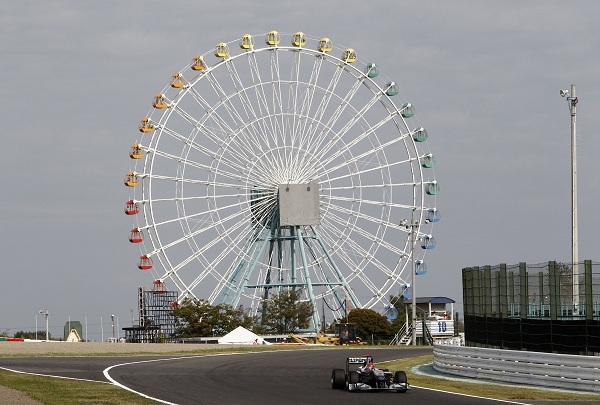 Day 1 at the Suzuka Circuit became the setting for a multitude of missteps by Formula 1 drivers. Highlighting the action of first practice session, Lewis Hamilton Friday ended in turn 9 when his McLaren-Mercedes slid off track. Making hard contact with the retaining barrier, the McLaren's left side suspension sustained heavy damage in the impact. Though Hamilton was unhurt, his was sidelined through the rest of the first as well as into practice session two as the McLaren F1 team worked to repair the valuable open wheel race machine. Hamilton did return for 8 laps on the afternoon practice placing 13th fastest. Prior to his crash in the morning, Lewis Hamilton's car was 5th quickest. In the second session, rapidly cooling track condition into the later part of the day robbed the Suzuka circuit of the more opportune grip of the first practice. several drivers experienced difficulty keeping their 300-plus kilometer per hour race cars on the track. Michael Schumacher, Robert Kubica and even fastest driver of the day Sebastian Vettel had moments of anxiety as they drifted off track. A 3rd and final practice as well as Formula 1 qualifying are planned for Saturday within what is forecasted to be very wet weather.